Just think about what the world has come down to! We’re living in 2018, and it’s sad to see how there are people who still believe in wrongful entitlement. Just because you’re related to someone in a natural indirect way doesn’t mean they’re bound to give you any favours. If you personally don’t know someone you just can’t expect them to make exceptions for you just because you’re related to them in an indirect way. I know all of this sounds confusing, so let me tell you what we’re dealing with here. 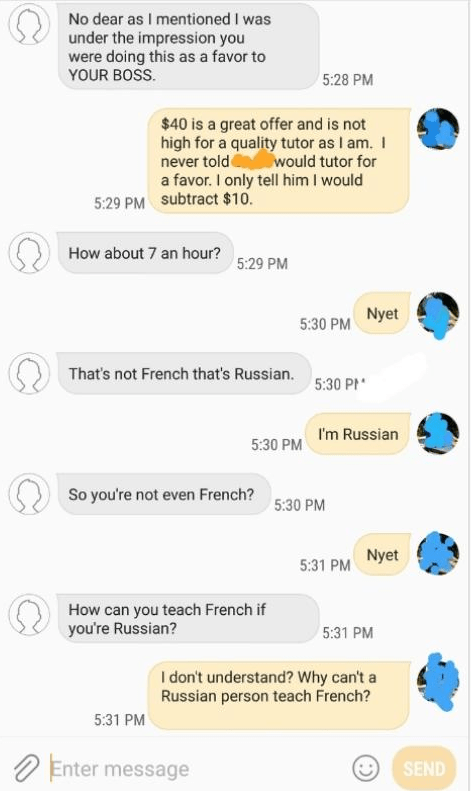 A few days ago, a language tutor named Anna posted screenshots of a conversation with a client on Reddit. 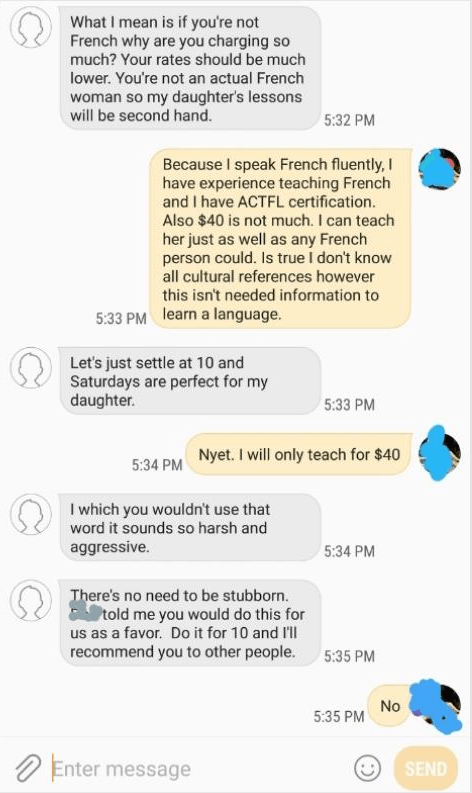 The client expected Anna to give her daughter French lessons for a very low price just because Anna happened to work for that lady’s brother. However, Anna handled the situation well and put that woman back into her place. 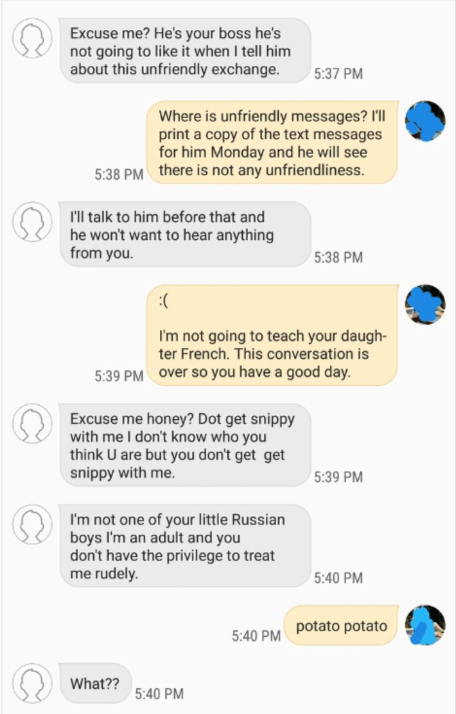 Scroll down and check out the whole conversation! It can be seen here clearly how she feels ENTITLED to the favour. But what’s more interesting is the level of her ignorance. And here’s the reaction when she couldn’t take “no” for an answer. Good job Anna. You did the right thing! 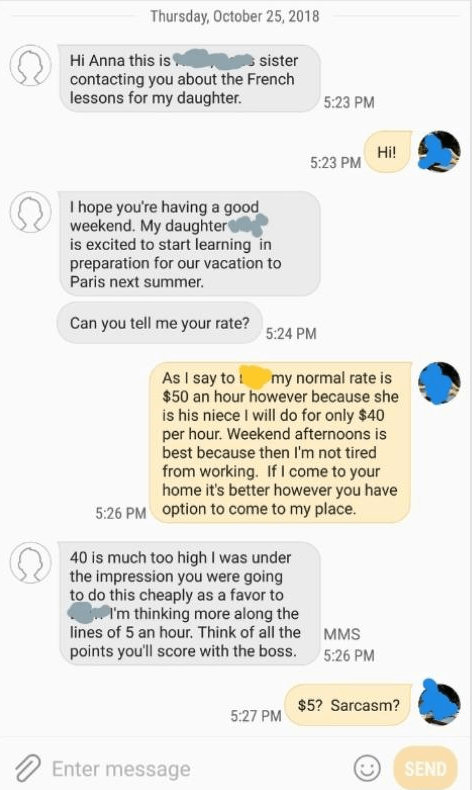 I think the straight-up refusal definitely serves her right! What do you guys think about this? Leave a comment below and let us know!